← AJAX and ZOE, Bouncing the strobe off the ceiling and using the widow light. 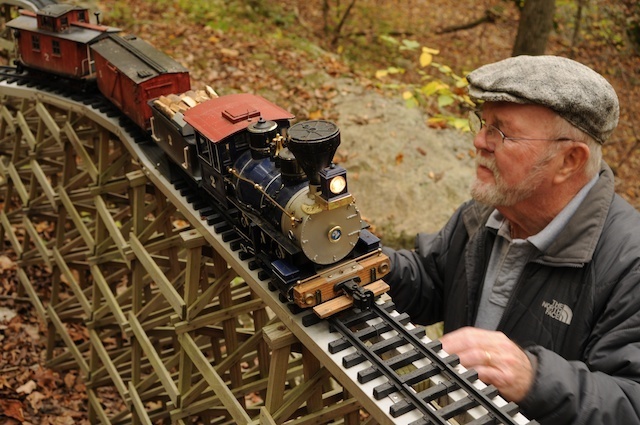 The Depot at Martini Junction, Geocaching and one man’s love for the Model Railroad. 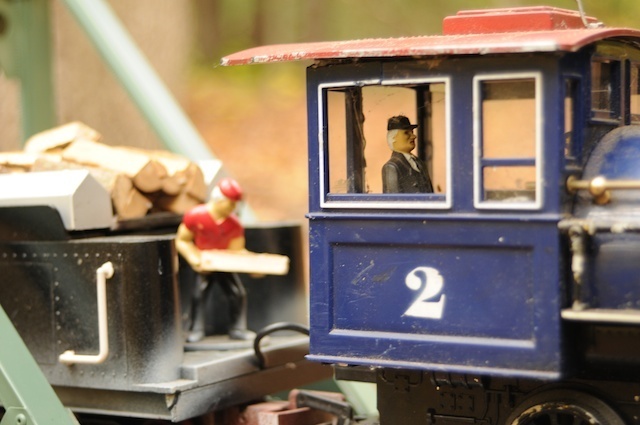 Earlier this fall I revisited our town forest with the hopes of running into Jim the depot train master. I asked him if he wanted to tell his story about The Depot at Martini Junction and the G scale railroad he built in the woods. 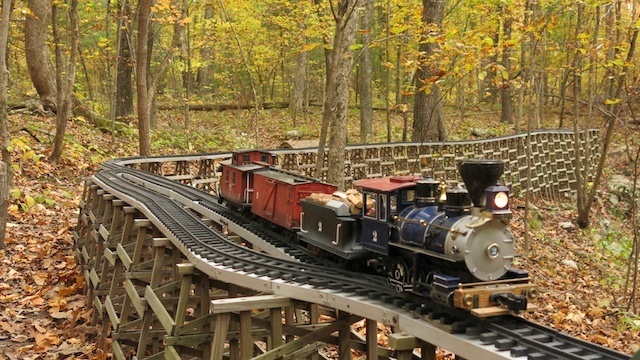 Jim’s depot is not just a miniature RXR station but it is a fantasy land for children and adults alike. I discovered the junction many years ago on cross country ski’s and have revisited the depot in many seasons. I have not yet had a martini there. Jim would like as many Geocaching enthusiast as possible to visit his site. “Chances are that not many of you have ever gone for a walk in a public forest and found a model railway just sitting there. Some twelve years ago I thought it would be neat if I could make my own trail which would connect with woods roads and walking paths into the town forest which abuts our property. In the process of working on the trail I came across a small brook which seemed to cry out for a little dam that would create a small waterfall. Of course, there would need to be a bench nearby so that one could sit and listen to the waterfall. The work on the trail continued but more and more the focus fell on the sitting area which soon acquired two more benches because, although my background had been in engineering, my calculations as to how many people could sit on the bench width-wise proved to be faulty as the original intent was to be able to sit four people for cocktails. A small table was added as well as a bird feeder and bird bath and I thought we were done. Then the train came. That Christmas my daughter bought a New Bright set for her tree and invited me to come over and take a look. This was my first exposure to “big” trains and plastic track and it occurred to me that this could be taken outside to good effect. I found that more track and turnouts could be had and we were on our way. Because of natural elevation changes at the site the obvious construction technique would be to build a trestle to run between the sitting area and the waterfall, which was about 80 feet. My idea was to have the line start at the bench, loop around at the waterfall and make another loop after passing back through the bench complex. The railway is raised between one foot and four feet for most of its length except for a small part of the bench loop which comes to grade. The bench over the track was converted to a tunnel with doors so that the locomotive and tender could be stored and locked. The upper section of the bench provides storage for a boxcar, caboose and tools. Some time later I came across Scientific Toys radio-controlled trains and with some modifications have been running these for about eight years. Modifications included substituting New Bright trucks fitted with Scientific Toys couplers and plating the cars with coffee stirrers. The pond and waterfall became a seasonal water feature with the addition of a sluiceway and waterwheel. Shortly after the trains started running I established a Geocache and Letter Box site co-located at Martini Junction. 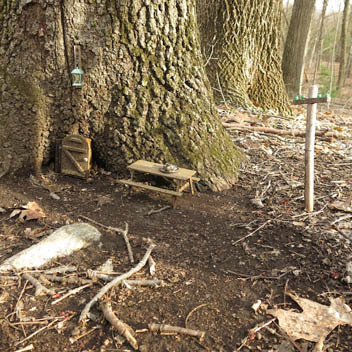 The geocache is called “The Depot” and the letterbox is named “The Birdhouse Letterbox. The Depot at Martini Junction includes a diner, freight platform and a maintenance office. 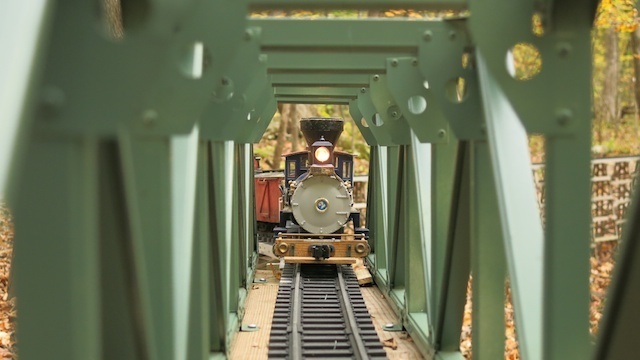 Both the geocache and letterbox have proven to be popular attracting an estimated 1500 visitors to date many of whom had never seen a G scale railroad before. People find the railway in a number of ways by using the Geocaching site with coordinates and a GPS device, the Letterboxing site which provides clues to the location, local media accounts, word-of-mouth and of course lots of folks just come upon it by chance. The railway is about a 15 minute walk thru woodlands from the nearest road access and miniature bird houses function as trail markers. Most visitors never get to see the train. We don’t have an operating schedule and only run the train if we’re their and someone stops buy. The run itself is simply a trip out to the waterfall and back again and takes only a few minutes. The batteries seem to last quite a long time if we limit repeat performances. This unique opportunity to work in a public space has been very special to me and I hope to be able to continue my effort. Just the other day a young boy who was visiting asked if I was the one who donated the railroad and though I hadn’t thought of it as a donation maybe that’s what it really is. It surely has been a great joy to me and I’m certain if has been fun for lots of others. We’ve found our way onto Google Earth and You Tube through unsolicited submissions and the results of “googling” Martini Junction fills a page”. 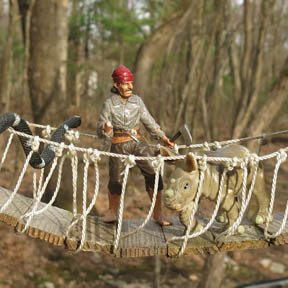 This entry was posted in Model railroads and tagged bench, bridge, brook, cocktails, dam, G scale, geocaching, GPS, Letter Boxing, Martini Junction, radio controlled, RXR, The Depot, town forest, toy, train, trestle, tunnel, walking, waterfall. Bookmark the permalink. 2 Responses to The Depot at Martini Junction, Geocaching and one man’s love for the Model Railroad. Great stuff, Want to go back & visit it! Pingback: Martini Junction | Follow the Paws!